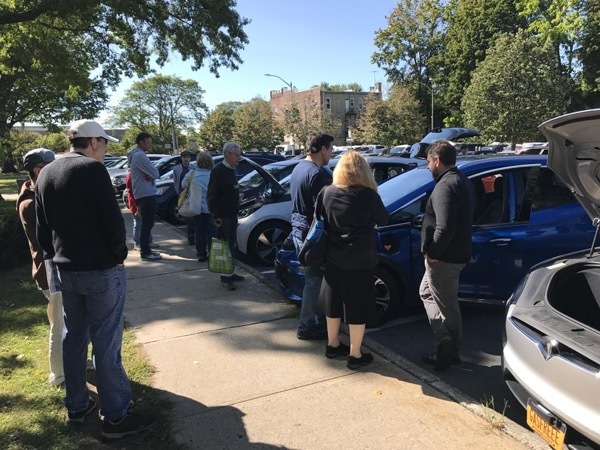 The exposure to non-EV drivers and the interest of attendees to become more sustainable in their life-style is a great synergy of having an electric vehicle showcase of 4 of most popular vehicles at Westchester County's Largest Farmers Market. Not only is it a good synergy, but the market is massive popular and has won 4 years in a row Best Farmers Market in Westchester. Over 3,300 people were at the farmers market and 1986 entered via our entrance which requires walking past our EV showcase. We had a LOT of exposure. On Saturday, September 9, the Pleasantville Farmers Market will host an Electric Vehicle Showcase. This event is sponsored by the local group Drive Electric (Westchester), and the annual National Drive Electric Week. We will present an Electric Vehicle Showcase. Aiming for PURE 100% battery electric vehicles. Here is the target vehicles. See the electric vehicles, talk to owners and learn more about them. Registered attendees report 344,441 electric miles driven.